"Don’t Take People for Granted"
SHERLOCK GNOMES is a funny animated comedy, mystery where Gnomeo and Juliet, two garden gnomes, help the sworn protector of all garden gnomes in London, Sherlock Gnomes, stop a plot to smash all the garden gnomes, but all is not what it seems. 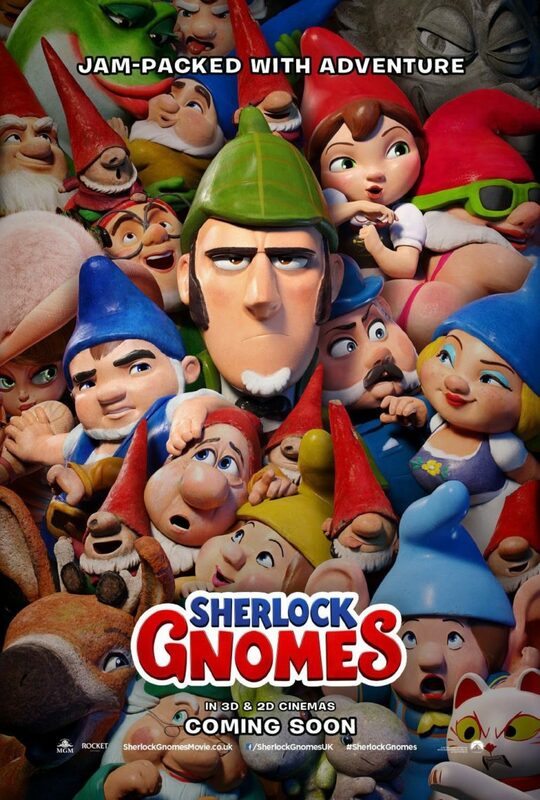 Though a bit jumbled in the beginning, SHERLOCK GNOMES has a well-structured mystery plot with lots of humor and adventure, nice plot twists, and a heartwarming message about not taking your friends and loved ones for granted. The statue characters, ornaments and figurines in SHERLOCK GNOMES are like the toys in the TOY STORY movies. They only come alive when humans aren’t looking at them. The movie opens with Sherlock Gnomes and Dr. Watson foiling a plot by his nemesis Moriarty, a pie company mascot, to smash some garden gnomes. In the scene, a dinosaur exhibit at the Natural History Museum falls on Moriarty and appears to smash him to bits. Cut to the garden gnomes and garden statues in the first movie, GNOMEO AND JULIET, moving to London with their owners. Juliet’s father and Gnomeo’s mother decide to resign as leaders of the garden gnomes. They bequeath their leadership to Gnomeo and Juliet. Now, the two must work together to turn the backyard into a beautiful garden. However, Juliet begins to take Gnomeo for granted and make all the decisions herself. This creates tension between the two lovebirds. So, Gnomeo decides to give Juliet a present of a beautiful orchid. With help from Benny, Gnomeo sees an orchid in a flower shop and decides to steal it. However, he runs into trouble, and Juliet has to rescue him. This results in another argument. When Gnomeo and Juliet return home, they find that all the gnomes and garden statues have disappeared. Sherlock Gnomes and Dr. Watson suddenly arrive, and Sherlock starts investigating the case. However, he’s rude to everyone, including Watson. While examining the scene of the crime, Sherlock can find no footprints identifying a possible kidnapper. Sherlock and Watson rush off to find some clues. Gnomeo and Juliet tag along, even though Sherlock rudely tells them he doesn’t need any help from amateurs. Can Gnomeo and Juliet keep up with the great detective and protector of all the garden gnomes in London? Will they find the missing gnomes? Will Gnomeo and Juliet patch things up between them? Will Sherlock ever give Watson the respect he deserves? SHERLOCK GNOMES is a bit jumbled in the beginning. The dialogue and sound seemed a little off, and the main plot takes too long to get started. The story soon gets going, however, and the adventure, mystery and comedy take off. Eventually, it leads to some nice twists and turns that wonderfully resolve the tension between Gnomeo and Juliet as well as resolve the conflict between Sherlock and Watson. The ultimate lesson learned in SHERLOCK GNOMES is: Don’t take your friends and loved ones for granted. You may need them to help you overcome the obstacles and problems that inevitably arise in your life. This is wonderful advice, of course. Just as important, though, is the idea in the movie that a little bit of humility and a forgiving spirit goes a long way toward drawing you closer to your friends and loved ones. The antagonist in the movie, Moriarty, has no humility and certainly no forgiveness. Unsurprisingly, he also doesn’t have any real friends or loved ones. Younger children, especially preschoolers, may not quite understand SHERLOCK GNOMES and its mystery plot. The movie does contain some scary moments, but they are rather light. Also, one garden gnome sits on a toilet, and another garden gnome has a skimpy costume that reveals his bare bottom. Finally, in a couple scenes, Gnomeo and Juliet are referred to as “partners” rather than as husband and wife, an element that seems a bit politically correct and appears to reflect a leftist attitude toward the traditional definition of marriage that’s so prevalent today, especially in the entertainment industry. Light miscellaneous content includes villains kidnap garden gnomes, Gnomeo steals a flower from a flower shop for Juliet, Sherlock Gnomes is sometimes rude toward other characters (including close friends), and Gnomeo and Juliet (though in love) are referred to as “partners,” as are Sherlock Gnomes and his sidekick Dr. Watson. SHERLOCK GNOMES is a funny animated comedy and mystery adventure. Gnomeo and Juliet and their friends have moved to London with their owners, Lord Redbrick and Lady Bluebury. Gnomeo and Juliet are given control of the new garden, but Juliet begins to boss Gnomeo around and neglect him. When all their friends disappear from the garden, they try to help Sherlock Gnomes and Dr. Watson solve the mystery. However, Sherlock seems to take Watson for granted too. Will this mismatched team find the missing gnomes? Will Gnomeo and Juliet patch things up between them? SHERLOCK GNOMES is a bit jumbled in the beginning. The story soon gets going, and the adventure, mystery and comedy take off. Eventually, it leads to some nice twists and turns that also cleverly resolve the main plot problems. The ultimate lesson learned in SHERLOCK GNOMES is Don’t take your friends and loved ones for granted. You may need them to help you overcome the obstacles and problems that inevitably arise in your life. SHERLOCK GNOMES also extols humility, forgiveness and sacrifice. MOVIEGUIDE® advises caution for younger children.